Mirabelle (Ini Edo) and her two friends Empress and Vivian are hot girls on campus. They have plenty of men and money at their disposal. When Mirabelle spots Lanre, a new student on campus she falls for him almost immediately and decides to make a move. She is used to getting what she wants and so she is perturbed when a mystery girl interrupts her getting close to Lanre not once but twice. One night at a club while she is talking to Lanre the mystery girl interrupts their conversation and drags him away to go and meet someone. Mira flips and later on when she sees the girl headed towards the ladies she decides to follow her and confront her. What happens next turns her world upside down. This statement is very telling. The promiscuous behaviour, the callousness is not done out of physical lust or need for intimacy but out of the need to feel the power that a man feels. Perhaps driven out of a need of powerlessness felt living in a largely patriarchal society? The scene where Mirabelle killed Lanre’s sister was so unbelievable. Why are people always dying in Nollywood movies form one simple shove and a head bang against the wall? No struggle for life nothing. We have seen this before in Somewhere in the Heart where Awole was given a slight shove, knocked her head against the wall and died. Yes of course this can happen, but most times a simple push is not going to kill someone! And when she is pushed she falls to the floor and is sitting up so perfectly and dead. I mean I’m not an expert on the dead but I expect a dead body to be lifeless and slumped. UniLAG looks like hot party central. Mini dresses, 4 inch heels, full make up and sun glasses. I have not attended a centre of Higher Education in Nigeria so I don’t know if it really like this. So for those in the know… Is this really the way it is? Vivian is loyal to her friend and has no intention of dating Lanre, but due to her friend’s hard headedness drops hints to suggest that she is indeed dating Lanre even though she isn’t. This is her downfall as Mirabel is ready to finish off anyone that stands between her and Lanre. She calls a reconciliation meeting with Empress present, but has another trick up her sleeve and the plan is already underway when she finds out that Vivian is not really dating Lanre! I would recommend the movie. It wasn’t anything too fantastic but it was entertaining to watch Mirabel act so crazy over a guy that she had barely spoke two words to. One thing that I did not understand that was included was the part where Mirabel’s politician father warns her not to have or talk to any friends anymore, as he didn’t want any scandals to taint the upcoming elections. This whole concept was poorly executed. If she is going to school with these friends how will she suddenly not talk to anyone? Wouldn’t it make sense for him to just tell her to be on her best behaviour and finished. Instead he comes with all this palava about moving into a house by herself and not talking to any person at all! Of course none of this she even did so it was pointless. All three girls performed well, and the crazy contacts Ini Edo was wearing added to her devilish character. Why am I not here more often. Bookmarking your site so I can stop here before I buy a new Naija flick. Matter of fact, I think I'm going to organize a Naija movie night for next weekend. Okay i feel the suspense? who is the chick? Vivian? seems like a good cast. Vivian is Oge Okoye… It will be finished… soon, but if you haven't watched it you shouldn't read any further anyway! I thought from watching the preview I would not like the movie. ini's contacts scared me away…(LOL) But I will trust you this time and go and get it…. I always thought the producers or directors made them wear it . I never knew it was a personal choice. Look how Jackie Appiah is dressed like rainbow brite all the time no matter the character… Must be a personal choice… I mean I have never been on a set but once I have and I see the wardrobe department then I will soon no how realistic or far fetched this notion is! Nolly I have watched the movie. It was good. As you stated earlier, the father's comments were so ridiculous. How can she stay away from her friends for no good reason. He also didn't want her to indicate that he was throwing his hat into the political arena, so what logical explanation could she give to excommunicate herself from them. That did not make any sense. A next portion of the movie that did not make any sense was the set-up between her and the server. They never showed any prior interaction between the two. A next pet peeve of mine is how can the mother and the judge be the same person in the movie. Is Nollywood getting so small that there is no credible person to play the judge? I find it riduculous for a judge to sentence her own daughter. Hi….I never knew this site existed until I googled my name…..And my eyes popped up……It feels great! I liked this film not bcos I featured in it, but bcos it had serious lessons to teach, especially to fathers who over-pamper their children…..And ladies with fiery temperament……Be careful…..To the site/blog-inspirator, thank you…U've made it a whole lot easier for us to interact with our friends who watch our movies and know where we committed blunder and suggestions on the way forward…Imela nke ukuu….Ndewo.. Thanks for coming by Ijeoma! I appreciate you taking the time out to leave a comment! Hmm my dear I don't even remember any song! LOL Hopefully someone can help you out before you have your party! 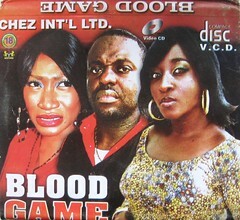 saw this movie last night on nollywood tv, im obviously late lol. didnt see all of it so cant comment constructively. Ini looked good, she lost a ton of weight, good on her. As other have said, only in nollywood does a little push result in instant death. Even flies dont die instantly when you swat them, lol. The movie wasn't bad… It was one of those easy to watch movies.